BEFORE YOU BUY ANY MANX DUNE BUGGY! The first dune buggies in California were any vehicle, Ford, Chevy, etc. that had the body removed and was able to ride the sand dunes. Bruce Meyers saw that the VW Beetle, with the body removed, did quite well on the dunes. 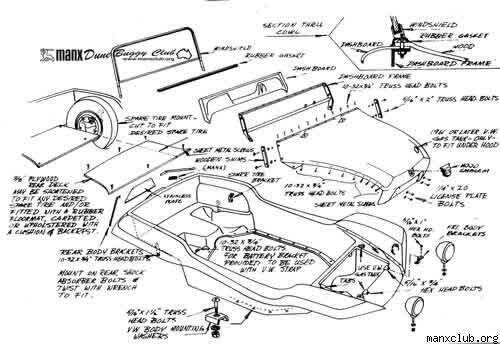 He invented the fiberglass body to sit on a Beetle frame and called it the Meyers Manx. Popularity soared. Almost 300 fiberglass body companies started imitating his design. Now it seems like everyone has a Manx style, Manx type or Myer Manix (as some call it). The truth is, they have no idea who made it, so when people ask them if it's a Manx, they just say it is. They say that only because it's a fiberglass body on a VW frame. There are very few real Meyers Manx's out there, a lot of people have built fake Manx's, bought Manx emblems and now try to pass it off as a real Meyers Manx. There is only one Meyers Manx and I am proud to own one. So, when people ask if it's a Manx, say NO, then tell them, it's a Meyers Manx, a real one! The hood has a small bump on it's nose, measuring 2" wide by 2 1/2" tall. This bump wore a silver and black sticker on the first 150 kits or so into early 1967, at which time the large black and silver plastic emblem covered this bump. Meyers Manx never had any other bumps, airscoops, ridges, furrows, or anything else on their hoods. Two tubular steel struts may be in place to stiffen the lower edge of the body at either side of the license plate. This continued to the end of 1971. The 1st floorpan model, produced into the 70's, had stiffening tubes glassed under the fenders from the pedal bulkhead to the engine bulkhead. These were first made of cardboard tubes glassed in and later a few with 2" vacuum cleaner hose glassed in place, but finally a fiberglass shape was tooled, which formed a tube-like structure under both fenders. The 2nd floorpan model was called the Manx 2. There were a few hundred Manx 2 bodies produced from late 1968 to late 1970. Some of these were apparently produced while Bruce was still with the company. Those kits have serial numbers starting with "A". Some of these kits had the stiffening tubes under the fenders. The Manx 2's produced after Bruce left the country had 4-digit serial numbers and no longer had the reinforcing tubes under the fenders. All Manx 2's are identified by a larger bump on the hood, the omission of the battery box sump and the spare tire well in the rear seat area - they were flat across the seat area, and the hood and dash were molded as one piece. The hood is 42" wide. Copyright 2013 MEYERS MANX FOR SALE. All rights reserved.